A and B, Participants who had Roux-en-Y gastric bypass (RYGB) surgery (hereafter referred to as the RYGB+ group) and participants who were scheduled to have, but have not yet had, RYGB surgery (hereafter referred to as the RYGB− group) consumed a 0.5-g/kg fat-free mass of alcohol (equivalent to approximately 2 standard alcoholic beverages). For each time point, scores on feelings of drunkenness on the alcohol day were subtracted from scores on the placebo day. Eight women were in the RYGB+ group, and 9 women were in the RYGB− group. C and D, Five women in the RYGB− group were retested at a mean (SD) 9.7 (1.6) months after RYGB surgery and 28% (10%) weight loss. The BAC limit for driving in the United States is also the BAC threshold for binge drinking defined by the National Institute on Alcohol Abuse and Alcoholism. The point estimates are mean values. Error bars indicate +SEM. aValue significantly different from “RYGB−” or “before RYGB” value, P < .05.
bValue significantly different from baseline value, P < .05. Roux-en-Y gastric bypass (RYGB) is the most common bariatric surgical procedure performed in the world.1 Although RYGB surgery causes a marked reduction in food intake and induces remission of food addiction,2 it is associated with an increased risk of developing alcohol use disorders.3 It is likely that RYGB-related changes in gastrointestinal anatomy alter the pharmacokinetics and subjective effects of ingested alcohol,4 which contributes to the increased risk of alcohol use disorders. However, results from previous studies are limited because (1) blood alcohol concentrations (BACs) were measured in venous blood samples, which underestimates the peak BAC delivered to the brain in patients who have had RYGB surgery, and (2) the subjective effects of alcohol have not been assessed using validated questionnaires. The purpose of the present study was to evaluate the effect of RYGB on the pharmacokinetics and subjective effects of ingested alcohol, using arterialized blood samples and a validated questionnaire. Eight women who had RYGB surgery (hereafter referred to as the RYGB+ group) within the last 1 to 5 years (mean [SD], 2.2 [1.2] years) and 9 women scheduled to have RYGB surgery at Barnes-Jewish Hospital in St Louis, Missouri (hereafter referred to as the RYGB− group), provided written informed consent and participated in our study (Table), which was approved by the institutional review board of the Washington University School of Medicine. Our study was conducted in the Clinical Research Unit at the Washington University School of Medicine. Fat-free mass was determined by dual energy x-ray absorptiometry. All participants completed 2 sessions about 1 week apart in which their response to alcohol or a nonalcoholic beverage was evaluated in a randomized crossover fashion. For each session, participants were admitted to the Clinical Research Unit after an overnight fast. An intravenous catheter was inserted into a hand vein, which was heated to 50°C by using a thermostatically controlled box, to obtain arterialized venous blood. The participants then consumed either a 0.5-g/kg fat-free mass of alcohol (equivalent to approximately 2 standard alcoholic beverages) or a nonalcoholic placebo beverage over 10 minutes. The BACs were measured using headspace gas chromatography, and a participant’s level of “drunkenness” was assessed by use of the Addiction Research Center Inventory5 before and for several hours after ingesting each beverage. Five participants in the RYGB− group were retested at a mean (SD) 9.7 (1.6) months after RYGB surgery and 28% (10%) weight loss. The statistical significance of values between groups and conditions was evaluated by using mixed analyses of variance. Blood alcohol concentrations increased faster, the peak BAC was approximately 2-fold higher, the total BAC area under the curve was approximately 1.5 times larger, and feelings of drunkenness were greater in the RYGB+ group than in the RYGB− group (Figure; Table). The same effects were observed in the 5 participants who were studied before and after RYGB surgery (Figure). The results from our study demonstrate that RYGB increases the rate of delivery of ingested alcohol into the systemic circulation, resulting in both earlier and higher BAC peaks and a greater feeling of drunkenness. 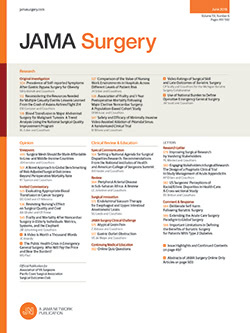 The alteration in alcohol pharmacokinetics means that the peak in BAC observed after consuming approximately 2 drinks in women who have had RYGB surgery resembles that observed after consuming approximately 4 drinks in women who have not had surgery.6 These findings have important public safety and clinical implications. The BACs in the RYGB+ group exceeded the legal driving limit for 30 minutes after alcohol ingestion, but the BACs in the RYGB− group never even reached the legal driving limit. The peak BAC in the RYGB+ group also met the National Institute on Alcohol Abuse and Alcoholism criteria used to define an episode of binge drinking, which is a risk factor for developing alcohol use disorders. These data underscore the need to make patients aware of the alterations in alcohol metabolism that occur after RYGB surgery, to help reduce the risk of potential serious consequences of moderate alcohol consumption. Corresponding Author: Marta Yanina Pepino, PhD, Center for Human Nutrition, Washington University School of Medicine, 660 S Euclid Ave, St Louis, MO 63110 (ypepino@dom.wustl.edu). Published Online: August 5, 2015. doi:10.1001/jamasurg.2015.1884. Author Contributions: Dr Pepino had full access to all of the data in the study and takes responsibility for the integrity of the data and the accuracy of the data analysis. Study concept and design: Pepino, Eagon, Bartholow. Acquisition, analysis, or interpretation of data: Pepino, Okunade, Eagon, Bucholz, Klein. Drafting of the manuscript: Pepino, Okunade, Klein. Critical revision of the manuscript for important intellectual content: Pepino, Eagon, Bartholow, Bucholz. Obtained funding: Pepino, Bartholow, Klein. Administrative, technical, or material support: Pepino, Okunade, Eagon, Bartholow. Funding/Support: This study was supported by the National Institutes of Health grants AA 020018, DK 56341 (Nutrition Obesity Research Center), and UL1 RR024992 (Clinical Translational Science Award) and by the Midwest Alcohol Research Center (grant AA 11998). Role of the Funder/Sponsor: The funders/sponsors had no role in the design and conduct of the study; collection, management, analysis, or interpretation of the data; preparation, review, or approval of the manuscript; and decision to submit the manuscript for publication. Additional Contributions: We thank Johanna Sonnenschein, DTR, BA, for technical assistance and Emily Lake, BS, and Nicole Smith, BS, for help with subject recruitment, all of whom are at the Center for Human Nutrition and the Atkins Center of Excellence in Obesity Medicine, Washington University School of Medicine, St Louis, Missouri; the staff of the Clinical Research Unit for their help in performing the studies; and the study participants for their participation. Study participants were compensated for their participation; staff members were not compensated outside of their salaries.